This is a Hallicrafters S-72L “barn find” I restored. This turned out to be a furniture refinishing project and not a radio (electronics) restoration job. It is a 1949/50 era portable with batteries and 1 volt tubes. When I brought it home the cosmetic condition was such, I kept it away from the litter box out of an abundance of caution to prevent it from being buried by the cats. This is a very early portable radio made out of plywood and coated with brown wall paper fabric imitating cheap portable record players and luggage of the era. I decided to laminate it with cedar drawer liner to give it some class instead of vinyl wallpaper. While learning to laminate wood is another skill outside the scope of this article, The trick when applying laminate is to prevent bubbles forming under the laminate. Also all divits and dents should be filled in with Bondo or wood filler. The surface is lightly sanded with very fine sandpaper and at least 8 layers of gloss water based floor varnish applied and allowed to thoroughly dry before the next coat. 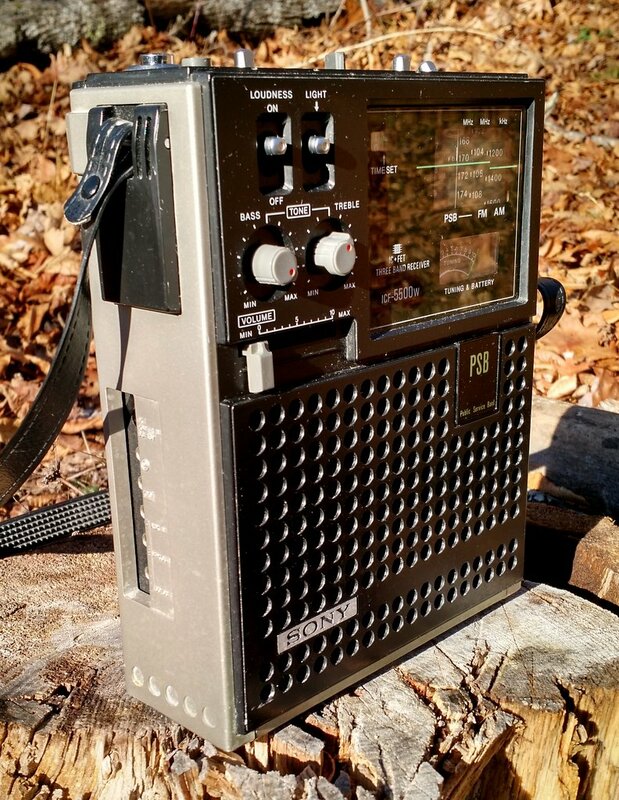 This radio has nice audio quality, It has a BFO and tunes the longwave band through 11MHz. The only regrets is cleaning it aggressively which took away a lot of the “old radio smell”, but the cedar aroma will keep the moths out. Fantastic, Ed! Thanks for sharing. I think you made a considerate upgrade to the S-72L. Great to hear this radio plays well and has excellent audio. I found one at a hamfest once in slightly better cosmetic condition, but much worse electrical condition than your pre-restoration unit. I’m sure I took a photo of it, but I can’t seem to find it in the archives. 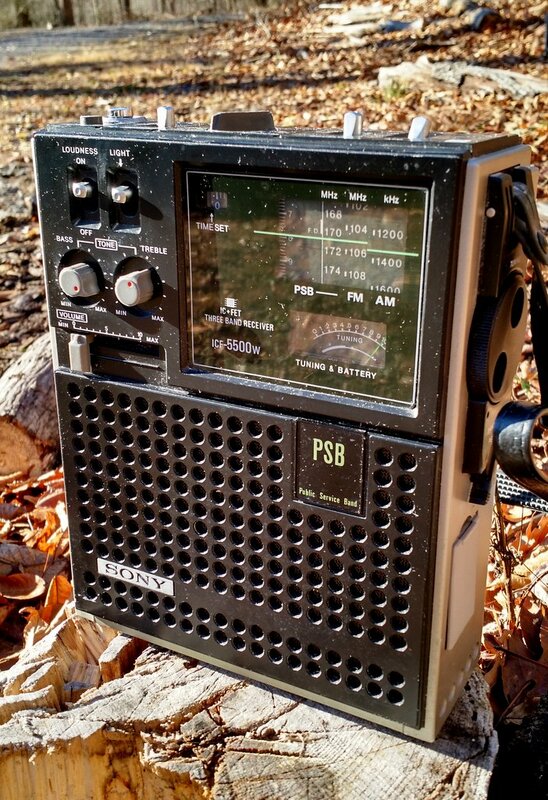 Post readers: any other Hallicrafters S-72L owners out there? Have you ever installed wood laminate on a radio cabinet? Please comment! 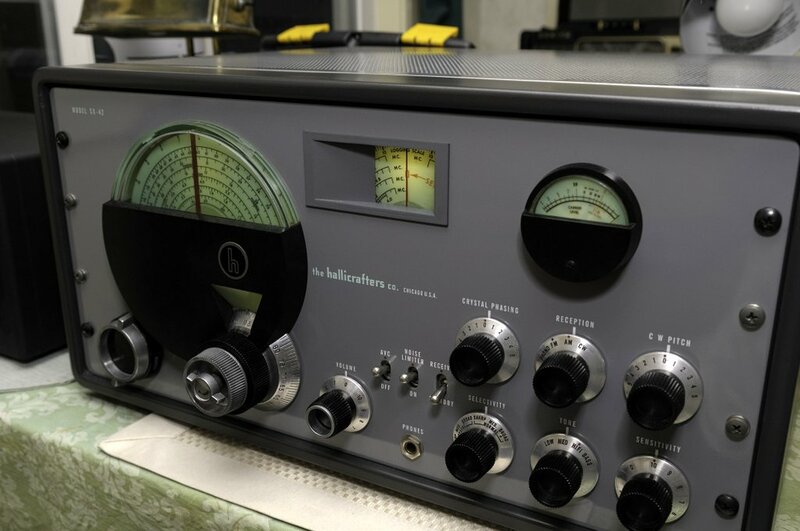 This entry was posted in How To, News, Radios, Vintage Radio and tagged Edward Ganshirt, Hallicrafters, Hallicrafters S-72L, Radio Restoration, Vintage Radio, Vintage Radio Repair on February 25, 2019 by Thomas. Vintage radios are fascinating. At one point the radio was the main method for mass communication of news and entertainment and was manufactured in a variety of styles to be prominently displayed in a home. Unfortunately, many vintage radios that have been physically preserved no longer function and it is impractical for them to be repaired. Described is the design and implementation of the Raspberry Pi Radio (RPiRadio), a device that bypasses the analog electronics of a vintage radio and digitally recreates the behavior of a vintage radio that is able to be tuned to vintage radio programming. 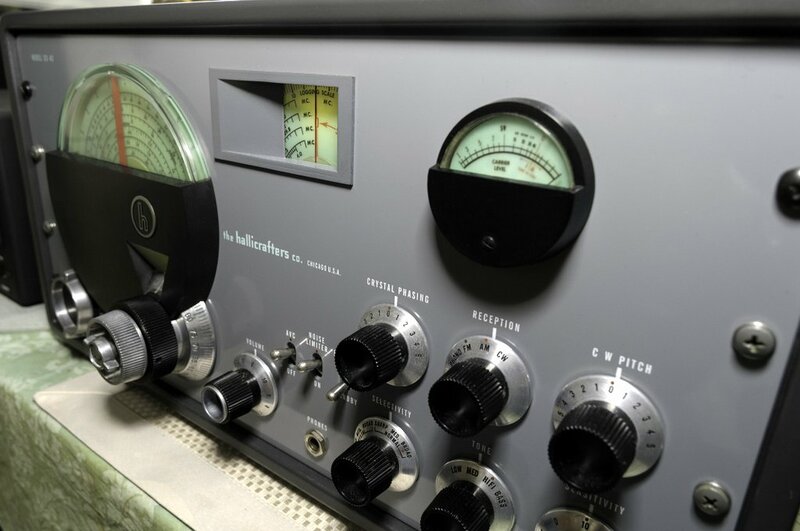 The whole posting may be found here, with extensive details on the building of the radio and how it was programmed for sound replicating the vintage radio era. While I love tinkering with old radios and trying to bring them back to life, some radios are just beyond reasonable repair. This can bring old radios back to life in a way which seeks to honor their past – a very cool idea indeed! 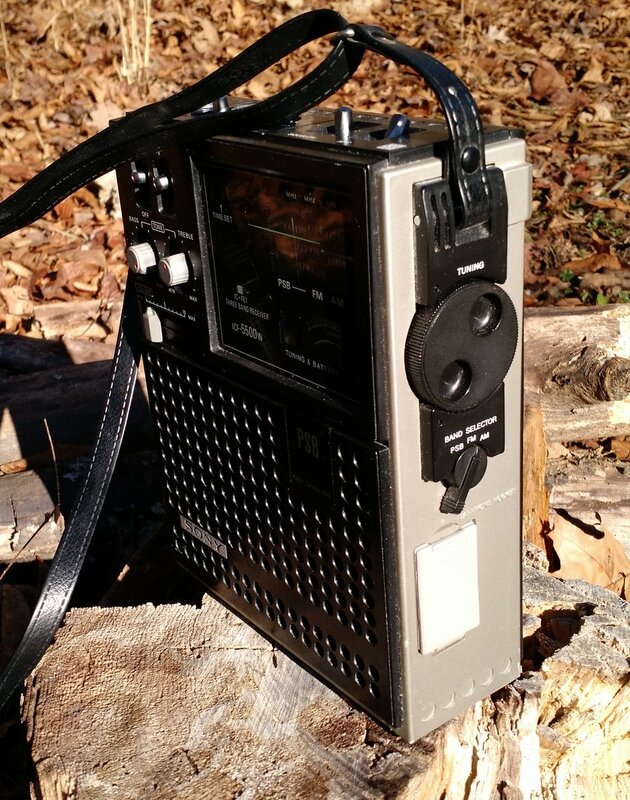 This entry was posted in Art, Boat Anchors, News, Radios, Slightly Off Topic, Vintage Radio and tagged Radio Restoration, Raspberry Pi, RPiRadio, vintage on June 7, 2018 by Robert Gulley. As a junior high student way back in 1978, I had a natural interest in radios. My dad was a ham radio operator, electronics engineer, and designer. We always had cool, exotic radios and electronic gadgetry around the house. He was also in the Korean War, in the US Army Corps of Engineers, with access to a wide variety of equipment. He often told me the story of how he became interested in radio at an early age, and how he saved up for expensive radio gear, with a little help from my grandparents. Back in 1946, Hallicrafters was THE brand to own, and their postwar designs from Raymond Loewy, were catching the eye of many enthusiasts. 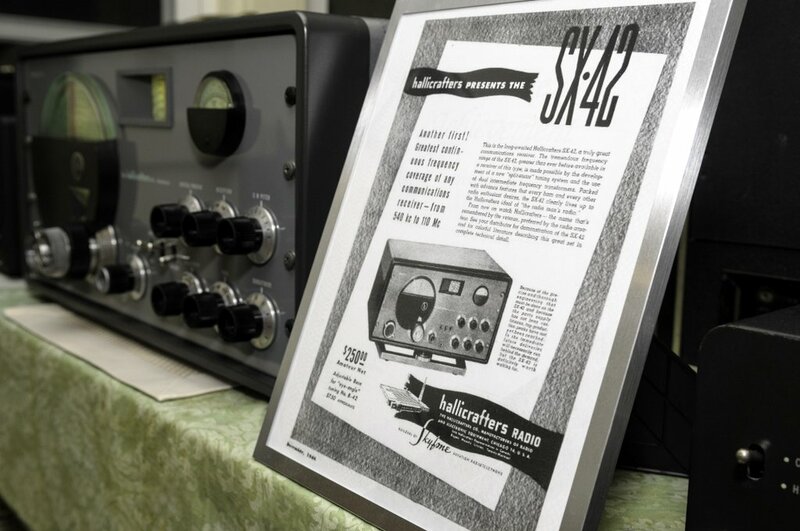 The SX-42 was being hyped up in Hallicrafters ads as the ultimate radio to own, one that could tune the shortwave and ham bands, and beyond. I don’t know the complete story, but prior to acquiring his SX-42, my dad also purchased an S-38 and S-40. Never satisfied with “good and better”, my father wanted “the best”. All 15 tubes and 50-plus pounds of boatanchor. Always ambitious and industrious, he mowed lawns, repaired motorcycles, and did odd jobs for neighbors in his suburban Boston neighborhood. He worked smart, and worked hard. And that fall, bought his SX-42. The radio, we think, was about $279, which would make it the equivalent of almost $3500 in today’s dollars. He heard the start of the Cold War, and the Soviet Union’s Sputnik. And the birth of Rock and Roll on FM! He graduated high school, went away to the Korean War, serving two Tours of Duty. He came back home, and became an electronics engineer. And a licensed ham radio operator. Moving ahead to 1978, and yours truly had the radio bug, in the worst way. Not as ambitious or as savvy as my father, a classmate, who was also a ham radio operator, told me about a National HRO he had, with some coils, and maybe needing some work. My Dad came home from work, and I just had to tell him about this great opportunity, which of course, would require his financial backing. At this point, the SX-42 and his other two Hallicrafters were seeing “backup” duty, having long since gone solid state in his post. “Hey, I’ve got an idea!” When a Dad says that, a son usually wants to run. Not in this case. “How about we give you my SX-42? !” Gee, twist my arm. I had loved watching those mesmerizing green back lit dials, S meter, and geared tuning knobs. Unfortunately for my classmate, he had to keep his National. Fortunate for me, I had my father’s SX-42! That radio logged my first 100 countries, including QSL cards from countries and stations no longer in existence. It heard the fall of the Berlin Wall. And, it was at the heart of my school Science Project, which made Science Fair, featuring an experiment on longwire shortwave radio reception. Years later, the focus became family, a child, and a house. The SX-42 and siblings came with me, but this time, in boxes. 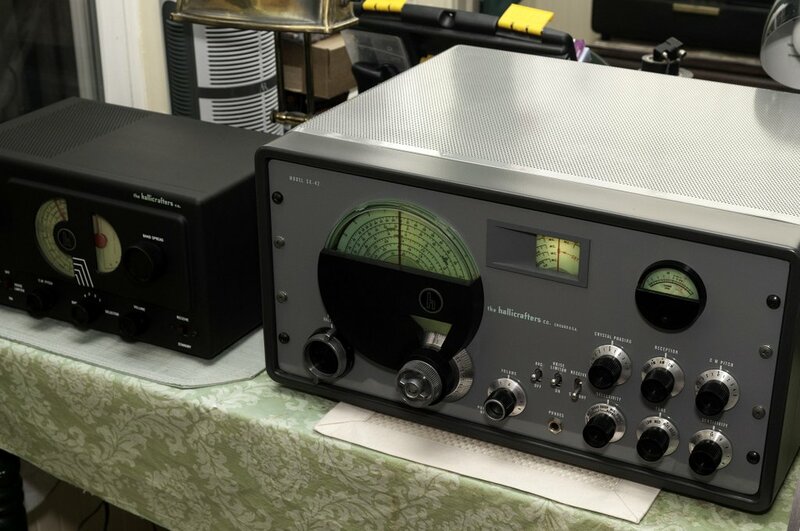 After having seen a WW2 vintage Hallicrafters S-20R at a consignment shop a couple of summers ago, I thought how cool it might be to have Dad’s radios electronically and cosmetically restored. The S-38 and S40 were in a box in my damp basement. While intact, they had a considerable amount of rust. Luckily, I was able to find a gentleman with great electronic and mechanical skills. He brought the S38 back to life, working and looking beautiful. And is working still on the S-40. As for the SX-42, that was upstairs in a box in my son’s closet. Dry and somewhat preserved, but with some corrosion on the control panel. And sadly, that iconic lock knob that switches between main tuning and brandspread tuning, had been lost in the move. I had to find someone who could take this project on. After an extensive search, I found my man. An engineer with his own business, who was moving into retirement, and shutting his business down. He had restored an SX-42 a few years back, with amazing results. I had to lure him out of retirement! Which I did after a few emails back and forth. And, he was within driving distance! First warning was “do not power the radio back up under any circumstance- you’ll fry the wafers on the bandswitch!” I resisted temptation, as I had read online that these were notorious for failure, usually to some original capacitors that leak over the decades. After 13 months replacing every capacitor, virtually every resistor, and vacuum tube, the iconic radio was coming back to life, in a great way. The transmission and gears in the tuning was re-lubricated. 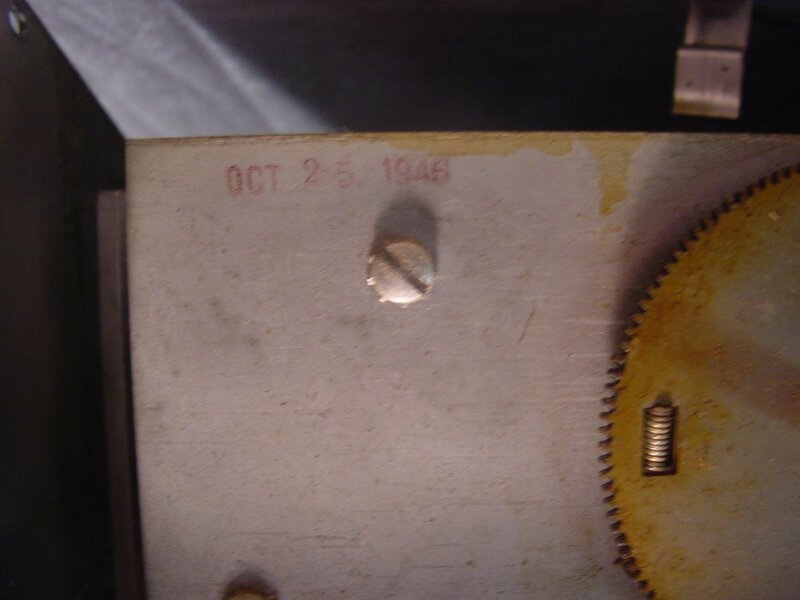 During the restoration process, a date was found stamped on the chassis of October 25th, 1946. Could it be? Hallicrafters had advertised in the Oct, 1946 issue of Radio News that “The first hundred are always the hardest to build.” This, coupled with the fact that none of the chassis circuit had been modified, lead my restorer to believe that my radio was one of the first 100 SX-42’s that Hallicrafters had built! 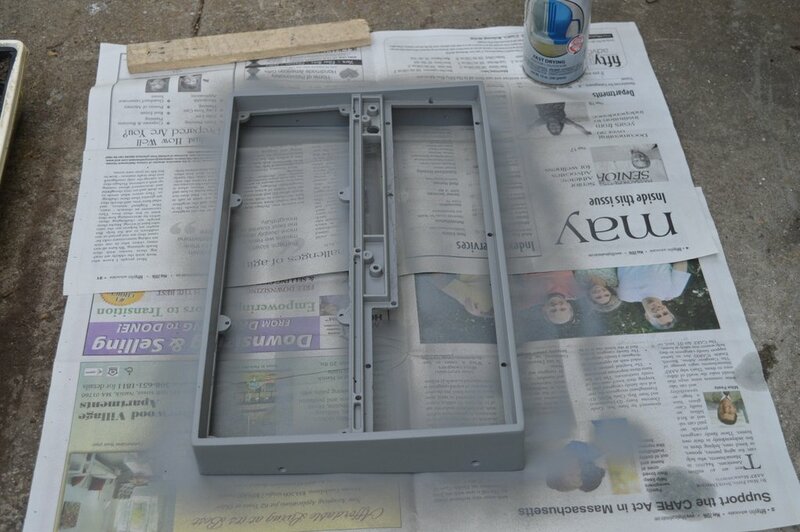 The front panel was stripped and treated, professionally painted and silkscreened. The cabinet and apron bead blasted, repainted, and clear coated. It came back home with me last month. A month after it turned 70. As you can see here, the radio looks stunning. And, with all the Hallicrafters Service Bulletin mods implemented, sounds and performs better than I remember. Maybe more importantly, we were able to locate a replacement brake lock knob for the tuning shaft, even with the “Lock” decal and arrow showing to rotate it counterclockwise. It just would not have felt complete without that little knob- and, it works! Engaging a set of what essentially are brake pads, you rotate it once to disengage the main tuning and engage the bandspread tuning. Again, and you’re back to main tuning. 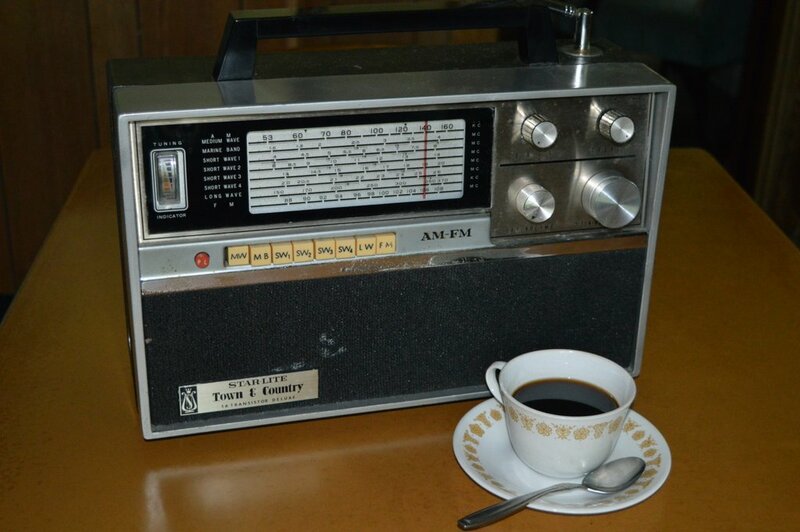 This radio will always remain a truly cherished family heirloom, and will be my son’s someday. 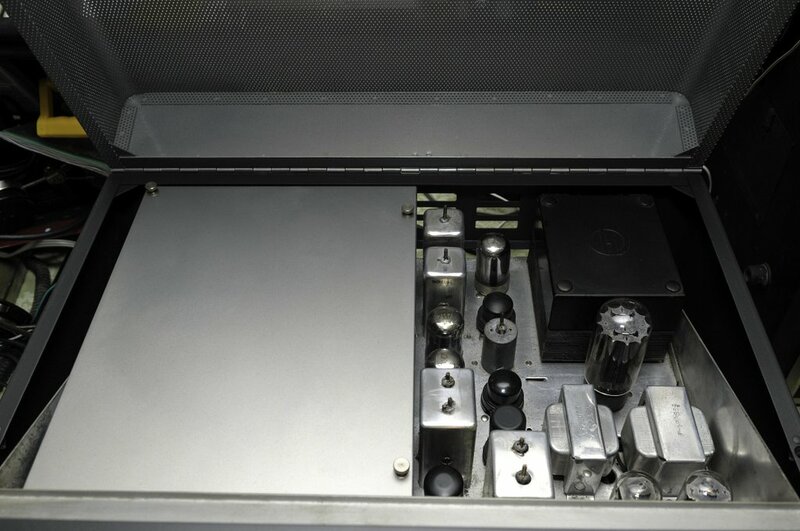 Complete with the original owner’s manual, and Darth Vader-like R42 Reproducer (speaker). Hopefully to live on for another 70-plus years, and hear more history along the way. Wow–! Thank you so much for sharing your story with us, Arthur. No doubt, your SX-42 will certainly outlive all of us and will hopefully continue to be passed down through your family. What a wonderful story. This entry was posted in Articles, Boat Anchors, Guest Posts, News, Radio History, Radio Modifications, Radios, Shortwave Radio, Vintage Radio and tagged Arthur Smith, boat anchors, Hallicrafters, Hallicrafters SX-42, Radio Restoration, Vintage Radio on December 4, 2016 by Thomas. This is a “mystery brand” radio that I picked up at a swapfest for a buck, I never heard of a Star-Lite Town & Country FM-820 by the HOKUYO MUSEN KOGYO CO in Japan. This portable behemoth is not “lite”, It is heavy (13 pounds). The only thing I came up with is Sam’s photofact that refer to radio. (I am not about to buy a service manual for something that is not broken). There is a Chrysler Town & Country station wagon, which is also a behemoth that swamps out all Google searches. This set appears to be made in the mid sixties. I was told that is was on a fishing boat as evidenced by its condition it was very dirty with a lot of corrosion on the bezel and missing a tuning knob. 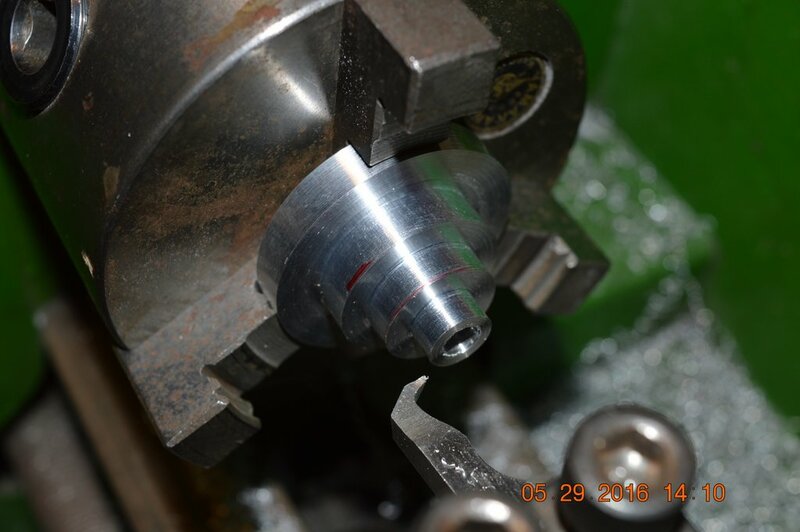 I fabricated a tuning knob on a lathe, which was a 2-piece affair. The outer knob is tuning and the inner knob is the fine tune. It cleaned up well and I had to repaint the bezel. The auto parts store said that the Chrysler of that area did not use metal flake paints but they matched a touch-up spray can of a Toyota millennium silver. This radio has 8 push-button bands: long-wave, AM, short-wave 1.6 to 26 MHz, and FM along with tone controls. The sound is surprisingly good it is a 6-cell battery only (no AC). It has reasonably good short-wave drift-free performance. The paint job looks good, there is a rusty chrome bumper next to the push-buttons. I decided to to restore this part. It is ok for your 1960’s Town & Country to have rusty bumpers. While you would not take your Panasonic RF9000 your Transoceanic or Grundig, This radio is my “beater” to take to the beach. Does anyone know about the Star-Lite brand? Thank you, Ed, for sharing this. I am not at all familiar with this make and model of radio. 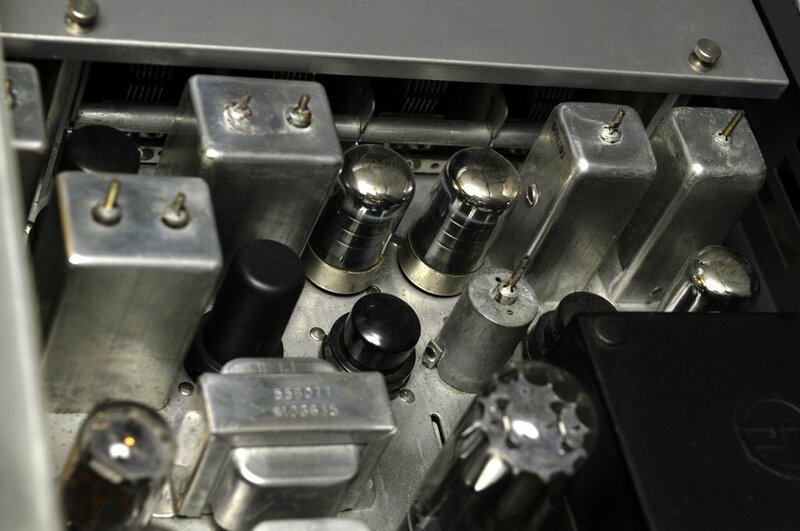 I must say…I’m most impressed that you were able to fabricate a tuning knob! It would have been a challenge to find a replacement knob otherwise. I bet she plays well, too–looks like a decent ferrite bar inside and a substantial telescoping antenna. Post readers: please comment if you’re familiar with the Star-Lite brand! This entry was posted in Articles, Guest Posts, News, Radio Modifications, Radios, Shortwave Radio, Vintage Radio and tagged Edward Ganshirt, HOKUYO MUSEN KOGYO CO, Radio Restoration, Solid State, Star-Lite Town & Country FM-820 on July 27, 2016 by Thomas. 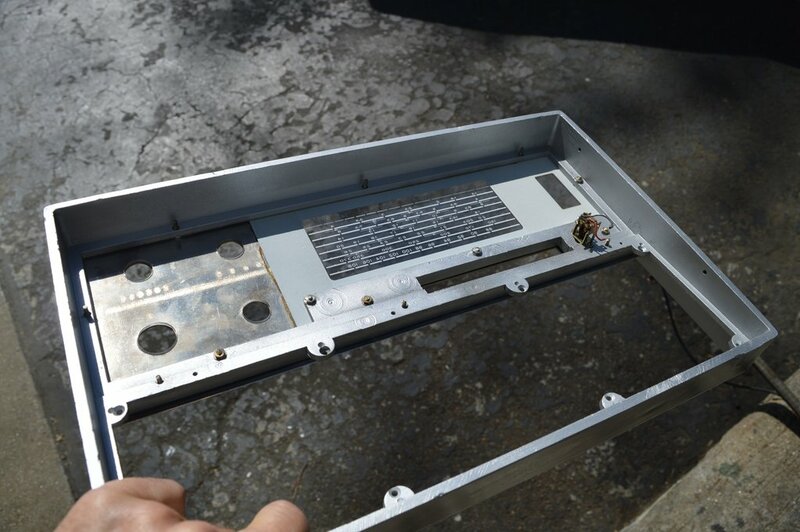 Best solution to restore a vintage plastic radio chassis? Friday, I brought home an untested, slightly grimy, Sony ICF-5500W. I purchased it through Goodwill for $20. I crossed my fingers as I put three C cells in the radio and turned it on. Fortunately, I was rewarded with brilliant audio. I tuned the ‘5500W on AM/mediumwave and heard CFZM, 500 miles to my north, and Radio Reloj, 860 miles to my south. A quick scan on the FM dial revealed that I could also hear all of my local benchmarks. Whew! Other than the dial needing a little calibration, and DeOxit on a few pots, it’s in excellent mechanical shape. I started cleaning the radio last night using Q-tip cotton swabs and a vinegar/water solution. I’d like to restore the hard plastic chassis’ original shine, though. I was tempted to reach for some Armor All, but stopped myself short. I know it would give the ICF-5500W a nice shine, but would it cause any long-term damage to the black plastic or clear dial cover? 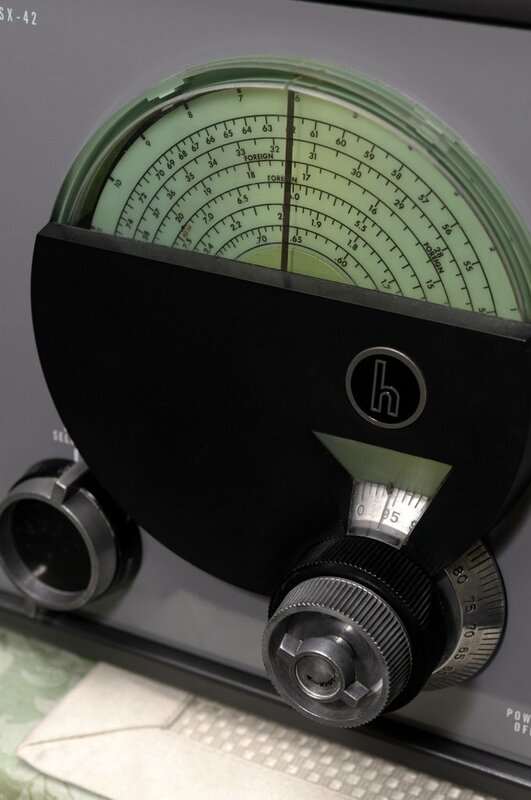 I know there are vintage radio restorers among the SWLing Post readership. Can someone offer advice on what’s the best product to use (or not use!) on my ICF-5500W? If you have experience, please comment! 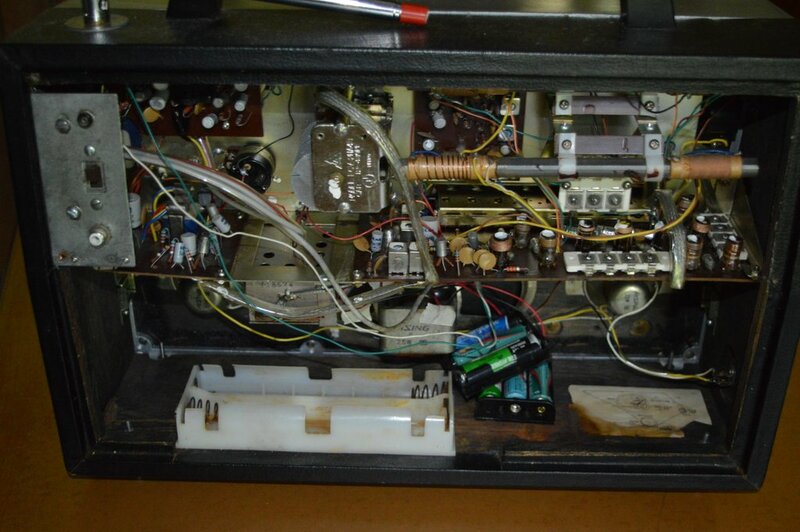 This entry was posted in AM, Articles, How To, Mediumwave, News, Radio Modifications, Radios and tagged ICF-5500W, Radio Restoration, Sony, Sony ICF-5500W, Vintage Radio on December 6, 2015 by Thomas.